Here's a concept: put the post office back where it belongs...IN THE PUBLIC SECTOR. The US Postal Service is some bizarre public-private hybrid that gets almost no assistance from the government, but isn't allowed to play on an even playing field with UPS and Fedex. Why not return it to its rightful place in the government and then, when tax revenue is helping to balance their books, the postal service will be able to consider lowering stamps even if only down to 35 cents. CNN As corporate as Fox. My mail man was just explaining to me how Bush had $63 million put into an account that the USPS can't touch. I'm sure, in order to bust the USPS. It's the USPS's money but they can't touch it. The remedy to their problems is to have it released. With the inception of the internet the service has become antiquated. It needs to be re-structured to keep in step with the times. I pay all but one bill online, that's one stamp a month. Online payments are more convenient, I don't have to worry about late charges because my payment isn't received on time because it was lost in the mail. Too often I get mail that doesn't belong to me. Put the service back with the government, lower the price of stamps and hire qualified personnel. Most that I've had to deal with are inept and lazy. 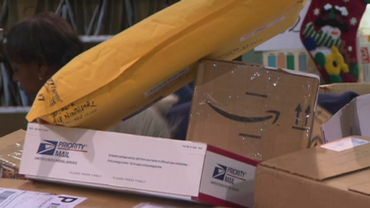 It will be a sad day when the postal service goes, hope this never happens..
Good article and interesting comments, both here and attached to the CNN page. Some readers, apparently, don't understand the current organizational set-up of the USPS (it IS a privately held public sector corporation--according to most definitions). For the most part, it seems to have made a reasonably successful transfer from government-funded agency to business-model corporation. The postal service's ability to compete (FEDEX, UPS, AMSCOT, etc.) and adapt to the current technology/service environment is hampered, in no small part, by congressional mandates established with its creation. And while there's certainly need for change and improvement, the United States still enjoys the largest and one of the least expensive mail delivery services in the world. Ya know, if the United Staes Postal Service dissapears for lack of interest, maybe people will finally see the true cost of things. When they have to go 30 miles to mail a letter or a package, when they have to pay mega $$$$ to mail anything (because there is no public sector equivalent) then maybe they will finally appreciate the US Postal service. Will FexEx or UPS take on the slogan "neither rain, nor snow, nor dark of nighr...."--yeah, right--only if you fork over enough cash, Baby!" Fight to keep the USPS! There should be no junk mail rate. They should be charged the same as us. That should balance their budget. The internet has killed 90% of what i used to spend to make payments by mail. I pay most of my bills and do most of my business and shopping via internet. I probably spent $20. or so every month doing things by mail, until i switched over to email and internet transactions. Now, i spend about a buck a month for snail mail. So, i'm sure the internet has hurt snail mail quite a bit over the last few years, killing their bottom line. Those on the Right think we need smaller government, which is one of the reasons why the PO is in the state it's in. Having a smaller government means privatizing more businesses, not bringing them back into the fold. Unfortunately, more often than not, these businesses don't bring in very much money, or none at all, because they are a SERVICE. That's what taxes are for, among many other things, to pay for these services. Cutting taxes doesn't help our low cost or free services, it gets rid of them. RIght now the PO is not getting taxpayer money through taxes, but they are still trying to provide a service at low cost like they did when they were government run. I'm just surprised our mail doesn't cost more than it does. I love sending cards & letters via snail mail, but the price of a first-class stamp has put an end to that. Now I hand make cards, scan them & email them around. Does anyone remember around the turn of the century when they were putting up a stink & blaming email for all their woes? The USPS was pushing to collect 5 cents an email. sigh. As many here have said, they need to restructure and get with the new. I worked for the USPS for 18 years, 1985-2003 and the Post Office went downhill the whole time. Yes the Internet has cut into the service but the major reason for its problems is poor management. There was a tendency to promote the worst people simply because they were "yes men." They would also put into service new ideas & equipment before complete testing on the functionablity was secured.